Spring Desktop is a colorful screensaver software that you can easily install and control from Windows. Opening the application brings a preview of an endless spiral spring that unfolds on your desktop. It is a dynamic, yet pleasant looking screensaver that can replace your desktop when your computer is idle. The screensaver is a Windows function that you can set to start automatically, when you are away from your computer for more than a few minutes. Basically, the screensaver is either a still image or a simple animation that can replace the current desktop. It is designed with a double purpose: save power and protect your data. Spring Desktop acts like a standard screensaver and requires a small amount of the computer’s resources, in fact it is designed to save power. The simple animated automaton is based on a simple semi-random movement command. 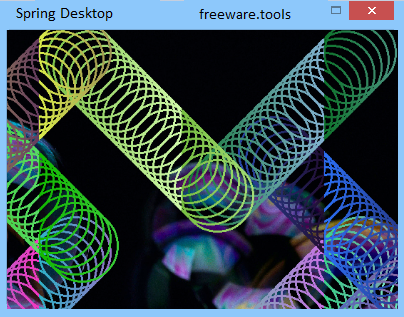 Spring Desktop brings a colorful spiral spring on your desktop, when your system is idle. Aside from saving power and hiding opened windows, the screensaver can also indicate that a system is running. Thus, you can easily enable the colorful dynamic screensaver instead of sending your computer to stand by, for instance. The waiting time can be set from the Screensaver section in Control Panel. Once enabled, Spring Desktop replaces your desktop with an automatically generated figure. The application does not offer you the possibility to manually set colors, speed, trajectory or key combinations/mouse movements that disable it. The spiral spring or coil spring is the entertaining toy that inspired this screensaver application. Spring Desktop brings an endless spiral spring like animation to your desktop, based on a random color variation. The screensaver is colorful, upbeat and it can protect your screen when the computer is idle.